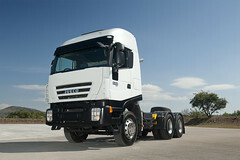 Iveco offers a 24 hour, 7 days a week roadside assistance programme called Assistance Non-Stop. By calling the toll free number 0800 11 6967 from within South Africa, you can request urgent assistance for your vehicle. A team of 18 operators, with nationwide coverage of 29 points located from the North to the South of the country, guarantee an immediate response and a rapid solution to any problem, by activating the Iveco service centre closest to the breakdown point and most suitable for the vehicle. On the road 365 days a year at your side.